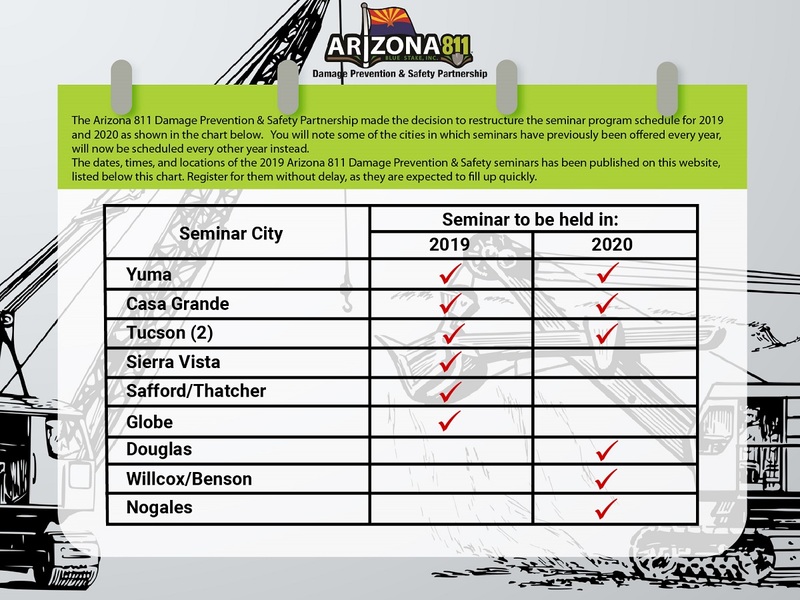 Arizona 811 is committed to providing free damage prevention and safety information to stakeholders throughout Arizona to protect lives, infrastructure and services. To sign up for training on our Learning Management System, click here. Seminars are free and include breakfast or dinner and training materials and door prizes. Participants learn how to protect themselves from serious injuries; prevent damage to the underground utilities we rely on every day; and protect their company or agency from incurring fines, damage-repair costs and reimbursements to businesses because of service interruptions. City of Yuma – Wednesday, March 13, 2019 from 7 – 10 a.m.
Casa Grande – Thursday, March 14, 2019 from 7 – 10 a.m.
Sierra Vista – Tuesday, March 19, 2019 from 7 – 10 a.m.
Thatcher – Wednesday, March 20, 2019 from 6 – 9 p.m.
Globe – Thursday, March 21, 2019 from 7 – 10 a.m.
Tucson – Tuesday, April 2, 2019 from 7 – 10 a.m.
Tucson – Tuesday, April 2, 2019 from 6 – 9 p.m. If you are an employee with Pima County or City Tucson, please register for one of the two Damage Prevention & Safety Seminars listed below. If you have any questions, please email Damage.Prevention@Arizona811.com. City of Tucson – Wednesday, April 3, 2019 from 7 – 10 a.m.
Pima County – Thursday, April 4, 2019 from 7 – 10 a.m.